When it comes to Indian food, the many different restaurants in Chicago seem to always be either too Americanized or in a strange location, making it a trek to get to. Personally, I have been blessed with the opportunity to live in India with some friends for about 6 weeks and enjoy the authentic food. My ratings are based on comparing the Indian restaurants in the city. That may be the only reason why Indian Garden is currently the highest rating. The food here is pretty good and when ordering from their menu, it is definitely more authentic than when enjoying their buffet. We order the Chicken Makhani, which actually uses pulled tandori chicken, rather than just cubes of chicken breast cooked in a sauce. The Indian buffet is a great deal, but is only offered at lunch time. Every time I come to Indian Garden, I use a Groupon... so I guess I would consider it a little on the pricey side. Despite the cost and only when concerning the a la carte menu, I can safely rate Indian Garden at 4 miles when comparing their cuisine to the others I have tried. Every time we order Indian Garden, we get the paneer bhurji. This dish takes the classic paneer cheese and rather than serving them as cubes, it is graded and then cooked with peppers, onions, and tomatoes. Obviously, typical Indian seasonings are utilized, giving the dish a yellowish color. I really enjoy this technique with paneer because every bite is filled with the cheese. It is very rich and you only need a little when adding it to rice. I am not as big of a fan of eating this dish with naan but my friends definitely do. The chicken makhani at Indian Garden is definitely some of the best that I have had in the city. Actually pieces of tandori chicken are deboned and shredded and then cooked in the yogurt curry sauce. I love how they actually use the tandori chicken pieces because the tandori spices really makes the dish. There is a great spiciness that continues to build as the dish sits. In fact, when you have left overs the next day, the sauce is significantly hotter. I believe this is a must have dish. Out of all Indian dishes, Malai Kofta is without question MY FAVORITE. I don't know if it is because it was one of the first dishes I tried or maybe because of its unique sweet flavor? Regardless, I always suggest ordering malai kofta when getting Indian food. This dish comes with three larger, spongy, cottage cheese dumplings that have been cooked in a mild, sweeter gravy. There are usually chunks of dried fruit mixed into the gravy or sometimes ground finely and added to the dumpling. I enjoy mixing the gravy from this dish with the spicier chicken makhani gravy to get that sweet and spicy combination. You can eat this dish with naan, paratha, or even just rice. My favorite is rice, so definitely get a side of basmati rice to enjoy. This may be the most expensive authentic naan you can order. Despite being $3.00 a piece, I can at least say Indian Garden uses a traditional technique inside a tandori oven. In fact, you can watch the staff making naan through a window near the buffet station. Naan is a flat bread that is stuck to the wall of a tandori oven. It is cooked at high temperatures to let it rise to about a quarter inch thickness and is very soft. It is a great vessel to pick up the indian entrees. The size is decent at Indian Garden, but whenever we order, we try not to get too much. These sweets were from the time my friends and I ate at their lunch buffet. 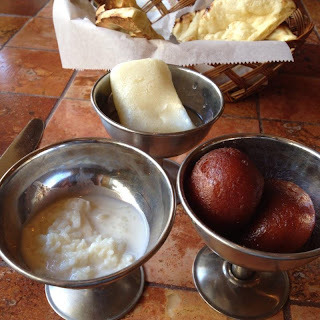 My favorite was the gulab jamun which is a milk pastry dumpling that is fried to a golden color and then allowed to soak in a sweet saffron syrup. These are served warm! They dish is extremely sweet because of that syrup and the consistency is incredible... sponge-like. I really enjoyed it. The other desserts pictured are a Bengali Chum-Chum, which I am unsure exactly what this is, and the kheer pudding, which is rice mixed with milk, raisins, and almonds. The pudding is sort of strange, not very sweet and not very savory. It is in an awkward category but I guess it is considered a dessert. Just give it a try. - Keep checking Groupon. Indian Garden has a deal frequently. And, they always allow carry out which is an incredible deal! - Don't let them know about the Groupon until you arrive to pick up the food. We have been shorted on some food before when letting them know about the Groupon ahead of time. - Don't order rice or too much naan from the restaurant. It is extremely expensive. I suggest ordering white rice from a local Chinese restaurant or making it yourself. Which Slice of Deep Dish Pizza Makes Me Sane?